Side Quests can be initiated once your character has met the requirements per quest. Each Side Quest is different and can reward various prizes upon completion. The list below will detail each Side Quests, required level, location for NPCs, and their reward. *The reward for Test of Kingdom will increase the amount of Stat Points received per level by +2; a total of 7 Stat Points per level. It is retroactive for Level 80 and above. **At the start of the quest "Tears of Kalia", you will get the quest item in your inventory. However, the permanent decrease in death penalty will only take effect after you have completed the quest. Should you die during the quest, the item will be gone and you will have to start the quest all over again. ***The reward for Bitter Ordeal will increase the amount of Stat Points received per level by +3; a total of 10 Stat Points per level (if you did Test of Kingdom as well). It is retroactive for Level 90 and above. The quest must be performed in order; you should begin from the level 30 quest and cannot take a higher-level quest first. If you are currently performing a quest (including the 1st/2nd/3rd/4th rank-up quest), you cannot take another one of these quests. Hunting spots for Bargons in the quest “For Her" are not limited in the “Forgotten Land" to avoid overcrowding in this map. Go to "Derik the Commandant" in Ricarten to begin the quest. Collect the quest items that "Civilian Minuren" of Navisko requires you. Refer to the chart below and get one of each: Golden Vamp, Silver Vamp and Bronze Vamp. These items can be acquired in no particular order. Go back to "Civilian Minuren" and exchange the collected items with a recommendation letter, and bring it to "Derik the Commandant". If you are currently performing a quest (including the 1st/2nd/3rd/4th rank-up quest), you cannot perform this quest. If you have any problems regarding distribution of Stats and Skill Points, make sure to take this opportunity to make it well-balanced. The Stats and Skills can be redistributed by the Event Girl which will be coming soon. Kindly wait for further announcements. Go to "Knight Commander Derik" in Ricarten to begin the quest. Go to Royal Mage Ray, a new NPC at Pillai Town. You should conquer Ray's Curse in order to be chosen as the Knight of Kingdom. CURSE: 30% decrease of final attack rate. Complete the quest while your character is under the Curse. Go back to Ray the Royal Mage to remove the curse. You can take the quest "Bitter Ordeal" only after completing the "Test of Kingdom". If you die during the Quest, the Curse will be removed and you should go back to Ray to get the Curse again. Hunt the following Clan Chief monsters to gather 5 items, one specimen for each Clan Chief monster. Go back to the messenger NPC to deliver the evidence, and get rewards. Go back to the messenger NPC, and get rewards. There is no previous quest, but you can’t do over other quests. 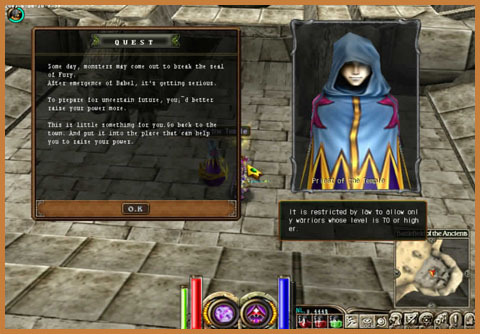 You can click the ‘Q’ button to see a detailed explanation of quest. During a quest, even if you give up on the quest, you will be able to resume it where you have given up. After the end of a quest, you will be able to get rewards. However, you have to have an available weight of over ‘152’, and space of ‘2 X 4’. After using all the pieces of C-stone, you can get additional Quest rewards even if you can’t finish killing all the monsters. After using all the pieces of C-Stone, you can get additional Quest rewards even if you can’t finish installing all the C-stones. The place where you can install the C-Stones is in the middle of fields. It takes 10 seconds to install a C-Stone. It will be stopped if you get attacked by a monster. Level 103 Armor items are untradeable, cannot be sold in a private shop or a normal store, but are able to be stored in warehouses, aged, and mixed. The following are daily repeatable quests. You get exp. Rewards for hunting the monsters specified by the NPC. Characters over Lv. 8 can do these quests at any time. Every time you complete a quest, you get rewards. When you accept a quest, the Lv. Section is divided by the character’s Lv. The number of monsters that you need to hunt will be on the chat window of announcing messages, and when you mouse over the ‘Q’ icon. Exp. rewards will be on the chat window after the end of the quest.